According to a 2010 AARP Study, over 90% of the respondents were over the age of 65 and stated that they wanted to remain living in their homes and communities. As you would imagine, it is hard for people to want to give up their independence and “control” by moving to an assisted/independent living facility. Unfortunately, as we all age, our senses, reflexes, and memory tends to decline which can make living at home or by yourself unsafe and dangerous. In home accidents, primarily falls, are the leading causes of injuries and emergency room visits for seniors. If you or your loved one have decided to age in place in the comfort of your own home, please view the senior home safety tips below to make sure that the house is safe and accessible for seniors to be living in. Consider a medical alert system or a buddy system. Patient alarms are a great alternative. Use a correctly measured and appropriate mobility aid. Such as: walker, rollator, power chair, power scooter, cane. All stair cases both inside and out should have sturdy hand rails on at least one side. The safest option would be stair lifts. 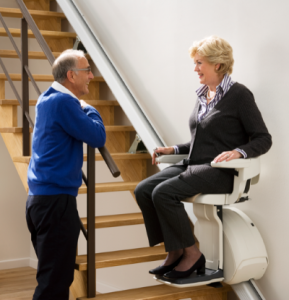 Read more on stair lifts HERE. All stair cases, main entrances, and hallways should have good bright lighting with light switches on both ends of the hallway or stairs. Remove electrical wires or cords from high traffic areas, or main living spaces. As a result of seniors choosing to live at home and independently there has become a huge demand for Home Care Services. There are thousands of different In-Home-Care companies that offer a variety of services, both skilled and non-skilled care. One of the many benefits of utilizing a home care service is that it allows your loved one to remain in their own home and keep their independence, while having someone around to assist them with house work, transportation, medication, cleaning, etc.